Compared with other areas of the Islamic world, there appears to be very little written about the traditional architecture of the Gulf, and even less about Qatar – although this is changing. It can be argued that Qatar’s architecture is not representative of the whole of the Gulf, but I believe it a reasonable place to look at if for no other reason than that it might be later compared with the architecture of other areas of the Gulf. It is also important to document what is there – and what can be remembered – as there is now very little left in Qatar which is truly original, if anything. Bear in mind when looking at the photographs illustrating the settlements outside Doha, that the extent of urbanisation was not significant, and that it was not until the 1970s that the development of the infrastructure network began to make a real impact on those settlements – both in physical as well as in social terms. The photograph above, and this to the side were both taken in the early nineteen seventies and are representative of the traditional architecture and townscape that existed at that time in Qatar. This photograph – of fishing boats drawn up in front of the fishermen’s houses at al-Khor – was taken in 1972, days before the area was cleared at the insistence of the householders who were pressing for the new housing then being offered by government. This was a common impetus, one that presaged the considerable physical changes in development of the Gulf. In many ways this view would have been similar for generations prior to the seventies, though it should be borne in mind that al-Khor was one of the larger conurbations in the peninsula. These two photographs were also taken in the nineteen seventies and are of al-Ghariya, just north of Jabal Fuwairat on the north-east coast of the peninsula and, below it, al-Mufjar, just east of al-Ruwais, right at the top of the peninsula, both fishing villages. It is notable that the houses are relatively small and that they tend to have their entrances facing away from the north from which the predominating wind, the shamal, blows. al-Ghariyah, has the sea to its east; al-Mufjar, has the sea to its north. Notice that the boundary walls are relatively low which implies they are for ownership and, perhaps, the containing of animals, rather than protection. This may not have been the case centuries ago when piracy was rife. There also appears to be two buildings, in the centre of the upper photograph, which have slightly battered walls, a feature that I have not seen elsewhere. You can also spot, between the two near buildings on the right of the lower photograph, mangrove poles being stored. From a distance these villages are not that impressive from an architectural point of view. They are basic settlements, sometimes with a masjid and its manara – as here, at al-Khuwayr, viewed from its south-east approach – creating a vertical interest in the otherwise overwhelming horizontal character of the development. It is notable that in these littoral villages the buildings and their associated boundary walls stand alone and, generally, are not joined together. With time it is likely that the boundary walls will have been amended as families grew and additional rooms provided either within existing boundary walls or immediately adjacent to them. It may also be significant that there are rarely defensive structures associated with these villages, which is surprising. It may be, of course, that there were such structures, and that they have disappeared with the increased security provided to the peninsula. What might have been anticipated would be, at least, a burj al-muraaqiba or watchtower from which threats from the sea might have been anticipated. This photograph, taken in 2008, is of the remains of al-Jumail, a village between al-Arish and Abu Dhuluth, both west of Ruwais on the north cost of the peninsula. As can be seen from this photograph and those above, many of the small fishing settlements on the coast of the peninsula have been abandoned, usually during the twentieth century as a result of the depressed economy. The State is now in the process of retaining or rebuilding some of these settlements, perhaps for two reasons – retention and safeguarding for future investigation, and as destinations with an eye to the burgeoning tourist arena. The houses, like those in the other villages, are simple structures, usually single rooms, and it is just possible to see on the left, a building with a gable wall still standing, which shows it once had a pitched roof that would have had a barasti construction. The villages above are all of permanent materials, their walls constructed from hasa and juss with, in the better or more lasting buildings, shandal poles forming the roof. But here is a photograph taken just north of Umm Said in the 1970s, and shows an encampment set up by fishermen who want to be closer to their source of income. The materials are notably impermanent with beaten out oil drums and barasti the main components. The photograph is here because it is likely to illustrate something of the character of the first developments along the coast centuries ago, settlements which took on a more permanent character as their success in fishing and pearling the adjacent sea improved. However, not all the coastal settlements were of this character. That at al-Wakra, south of Doha, was much richer and saw a higher order of architecture developing there. In this photograph, taken in April 1972, you see a view of a representative housing group in the centre of the settlement, the main buildings being oriented on their long axis in approximately a north-south direction, their backs to the west and their open sides, at first floor level, facing the sea to the east. The photograph was taken after the town had effectively been deserted, apart from a few houses maintained by fishermen, due to internal problems which are not the province of this note. The first of this next group of photographs was taken, I believe, some time around the end of the nineteen-forties, and shows the centre of Doha focussing on the creek which moved through its centre into the bay. You can see that the creek was, at the time the photo was taken, dry with the wadi clearly seen acting as a road, a common arrangement all over the world. Although dry at the time the photograph was taken, this thoroughfare was often wet during the winter months as it drained a considerable area of the higher ground of the hinterland, eventually requiring a dam to be constructed in order to control the annual problem. Housing established itself alongside it as a natural boundary and, in common with many other natural drainage systems, it was developed into a road in the sixties when it was first drained and paved. In the bay to the west (left) of the creek can be seen the old jetty – min’a – with some small craft moored to it. Behind the jetty, and backing up to the main graveyard – maqbara – can be seen the suq, illustrating graphically the strong link between the jetty where goods would be brought in and the area where they would be sold. It is also possible to see the general grain of the housing to its south-east (the bottom right quadrant of the photograph) feeding to this central facility of the town. This aerial view of the old fort in the centre of Doha shows more accurately than the photo above, the character of the layout of the fort. The main entrance to the fort was on its west side – its left in this photo – with the walls protected at their corners on three sides by circular towers and, on its north-west corner by a rectangular tower reinforced at its base. Accommodation was provided on all internal sides of the fort with a larger block in its south-east corner. The main maqbara, graveyard came close to the walls of the fort on its north-east corner and Doha’s ’eid prayer area is the walled-off space to the west of the fort. I don’t know what the building to the south of the fort is, or was, but that area is likely to have belonged to one of the leading pearl merchants, as a line of shops, developed later and leading from the Wadi Sail, terminated at that point. The next group of photographs are interesting. 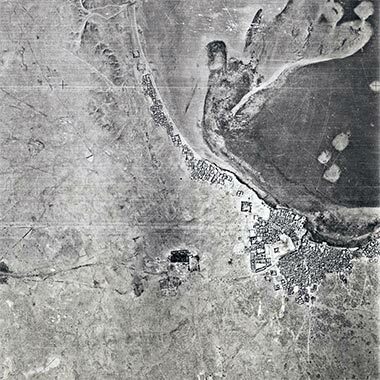 This particular aerial photograph, taken in 1947 from the north-west, shows the littoral edge of the centre of Doha. There are a number of points to make here. Two of the main merchant families had their properties right on the sea edge. The Darwish and al-Mana compounds can be seen here with the capability of landing goods directly into their properties and into their warehouses. The main suq stretches away to the south-east of their properties and the main maqbara constrains development to the south. Wadi Sail can be seen in the top left corner of the photograph as a dark line. Looking at the photograph in a little more detail you can see that the majority of development is two-storey and that the ground floors are relatively high. The sikkak system is both narrow and uneven and generally feeds south towards the maqbara where there was a road which fed east to the Wadi Sail and west to the Kuwt or Turkish fort and, thence to the Diwan al Amiri, and road to Rayyan. There was no access along the littoral wither east or west. Note there are no wind towers to be seen but that the buildings have first floor rooms facing the sea in order to benefit from the morning on-shore breezes. In fact there was only one wind tower in the centre of Doha, and that was south-east of the centre. Fifteen years later, this aerial photograph, taken in 1972, looks over that part of the central area which can be seen in the top left corner of the above photograph. This group was the compound of members of the al-Mana family and it can be seen that they had continued to develop the structures on their site in the intervening years. The additional buildings reflected not only the growing size of the family but, particularly their need to store the material for which they were the agents. In addition they illustrate the changing character of architecture from the traditional to a stylised influence from northern Arabic states. The first photograph, two above, shows that their land fronted onto the sea, allowing goods to be moved in lighters from the larger vessels standing out in the bay, but by 1972 the first road, Abdullah bin Jassim Street, had been built along the frontages of these properties linking the Diwan al-Amiri with Jabr bin Muhammad Street running north-south to the east of the suq. At the front of their property, facing the road, the family constructed a two storey building with distinctive bow windows, which were a feature of that part of the urban scene. In this more detailed aerial photograph, something of the character of the Gulf courtyard architecture can be seen. This can be compared with the lower of these two photographs which was taken in July 1977, looking south of east, and shows the same buildings across the sikka when the buildings to their west had been demolished, and illustrating something of the mixture of traditional Gulf styles of architecture. Here, in another photograph from October 1972, you can see that not only was Abdullah bin Jassim Street developed, but the government had begun the creation of the Corniche with the land between the two road systems being set aside for government buildings. In this photograph the al-Mana buildings are on the right with the single storey Standard Chartered Bank joining it, and with the Darwish offices just left of top centre and the rolling concrete roof of the government vegetable market to its left. Part of the land created between the two roads can be seen as yet to be unfilled. And, here in the top left corner of the first photo are a couple of very interesting features. This is the Wadi Sail, the main thoroughfare as well as the natural drainage channel for winter rainwater falling to the south of the town. It was obviously still being used as a wadi in 1947 as you can see a crude pedestrian bridge across it and, to the east of it, a small boat indicating that boats were pulled up this far inland in those days. The main masjid in the suq is the large building on the top left corner whose mihrab is discernible and, on the right, the barasti roof on the covered suq can be clearly seen running from top to bottom of the photograph. On raised ground, a couple of hundred metres west of the centre of the suq, the ground rose on a small promontory. At this point the Ruler of Qatar built his palace, one that was never really completed. Here you see an aerial photo of it, taken in the nineteen forties, its main entrance facing north to the sea which is off the bottom of the photograph. The old settlement of al Bida was a few hundred metres to the west of the palace, off to the right of the photograph. The palace later was developed into the Diwan al Amiri. I have included this aerial photograph of the old jetty at the centre of Doha’s suq as it illustrates one of the problems that Doha faced with regard to access to deep water. All around the peninsula there are shallow reefs that to some extent protected settlements from piracy. Those familiar with them would be able to navigate through them, but they presented a hazard. The main jetty for the suq had to be pushed out some distance, both to accommodate the draught of the boats bringing in goods as well as to provide quay space for the numbers using the jetty. As mentioned earlier, some of the merchants developed their own, smaller, jetties in order to land the merchandise for which they had agencies. 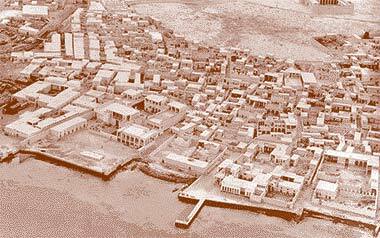 Darwish and al Mana are the merchants who developed immediately to the west of the jetty. 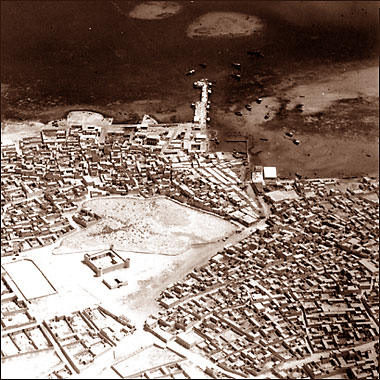 This next group of five aerial photographs give a glimpse of Doha in 1947, 1952, 1953, 1959 and 1971 respectively. They illustrate something of the relatively rapid growth of the nation’s capital during the period following the end of the Second World War. The first three photographs show the relatively small area covered by Doha in the early nineteen fifties. 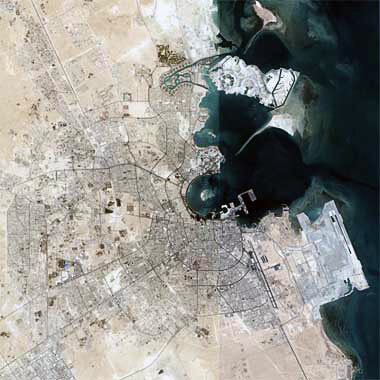 In the first photograph the character of the reefs and shallow waters of the bay are evident along with the littoral development of al-Bida stretching to the west of Doha. This was also the route along which people travelled between Doha and al-Khor and villages in-between. Only later was the north road constructed some way inland. 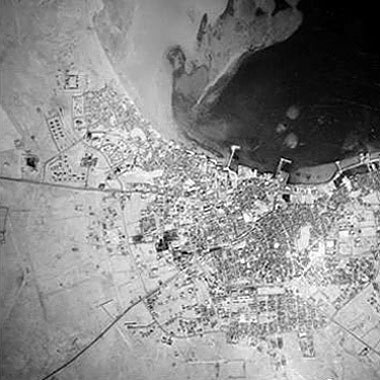 Feriq al-Salata is on the right of the second photo facing the east bay with the sea to its east as yet unfilled by the development of landfill adjacent to what became the Qatar National Museum; the two jetties – the Ruler’s jetty and the main, traditional craft jetty used for trade and fishing activities – can be seen clearly, and feriq al Bida and Rumailah can be seen on the left. The roads leading west to al-Rayyan and south-west to the border with Saudi Arabia can be clearly seen. The latter is known as the Salwa road, Salwa being the conurbation at the border. The third photograph shows that the traditional craft jetty was being developed in 1953 with the beginnings of the development of the littoral adjacent to it as the merchants sought to improve their access to the sea together with their developments on land. The Wadi Sail, the wadi that flowed through the centre of the suq, can be seen as a white line through the suq, almost joining the dark line of the Salwa Road. Near where these two lines meet on the photograph was a dam constructed in order to control the flood of water which periodically drove through through the area known as Musheirib and through the suq on its way to Doha’s bay. The dam was generally effective in preventing the inundation of the suq, but water still flowed along the road system when the winter rains brought excessive water into Doha that could not be cleared by the drainage system. This produced a very muddy road which certainly reduced the attraction of the suq for many during these periods. In the photograph above, a small bridge can be seen crossing the wadi and linking the two sides of the central area. You can see in the upper photograph that there is no structure to the town other than the natural agglomeration of housing as the town expanded, though the roads leading to the west and Rayyan, and the south-west and the Saudi border can be plainly seen. Six years later there can be seen to be the consolidation of development, particularly to the west in the quadrant between the Rayyan Road and the coast. This photo shows a very different urban structure from the tighter development in the centre of the town as this area had a number of villas constructed for the oil industry, the Rumaillah hospital, the Guest Palace for visiting Heads of State, and the fort which is the small square structure at the furthest north extent of the development. Perhaps the most significant thing to be seen in this photograph is the coastline. The three small reefs north of the jetty can be clearly seen but so too can the shallow water which stretched over much of Doha’s bay, or West Bay as it came to be called. Boats were dragged up onto the shallows though the larger craft had to stand out even with their relatively shallow draughts. With the lack of a proper sewerage system the area showed evidence of pollution witnessed by the plants which flourished there. 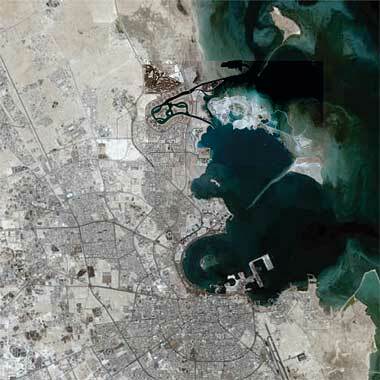 The need to clear this area and allow the sea to wash and clean the coast line was one of the reasons that the West Bay was dredged and the New District of Doha created. By the beginning of the seventies, the bay had not yet been cleaned up but significant changes had been initiated on land. With increasing pressure developing from the world-wide demand for oil, the beginnings of a clear, hierarchical road structure had been put in place. The ‘A’ and ‘B’ ring roads can be clearly seen with the latter close to the western edge of the photograph. This can be compared with the next photograph where the ‘D’ ring road can be seen as dark grey, joining to the road serving the north of the country, the North Road. At the top right of the photograph the new port can be seen with its jetty stretching east north-east, and with a parallel and public jetty below it, but with the Corniche in this part of the town, al Salata, not yet started. The Corniche on the west side of the photo can be seen with the areas between the old coast and the new Corniche in the process of being filled. Note in both photographs the marine reefs which restricted movement around the port area, but which were later taken out in order to resolve this problem. 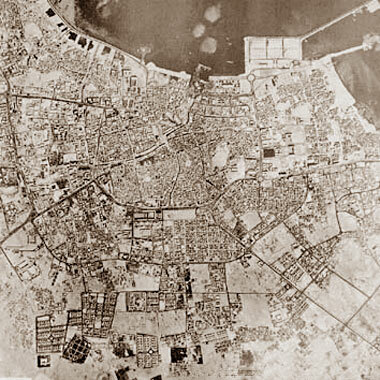 This map is of the centre of Doha and is likely to have been made from photographic aerial images taken around 1970. The police post which marked the north end of the suq can be seen, set on the diagonal top right, with the wadi Sail running past and to its east. But there is little development north of the masjid which is just north of the bend in the wadi, bottom right. Abdullah bin Jassim Street has been constructed, linking Jabr bin Muhammad Street to the east with the Clock Tower roundabout in front of the Diwan al-Amri and Sheikhs’ masjid to the west. The maqbara, Kut fort and the open-air ’eid prayer ground can be seen at the bottom of the photograph, while there is as yet little development along Musherib road which led, south-west, to the Arab Bank roundabout. By the beginning of the 1970s, the Qatar peninsula had been mapped completely, the work being carried out by Hunting Surveys. 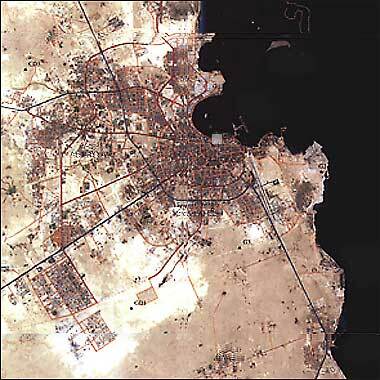 This partial map shows Doha around 1970, judging by the development shown. 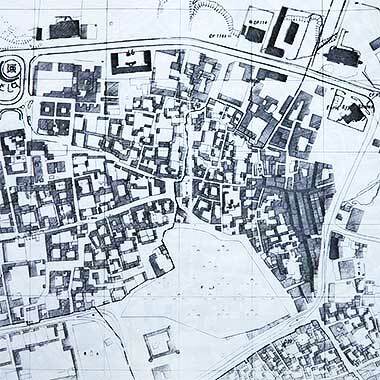 The main element of the port appears, but the extensive public housing at Medinat Khalifa has not yet begun to the east of the North Road, termed Ghaza on this map, though the army barracks north of the intended public housing exists. By contrast, this aerial photograph shows Greater Doha round about the turn of the millenium. 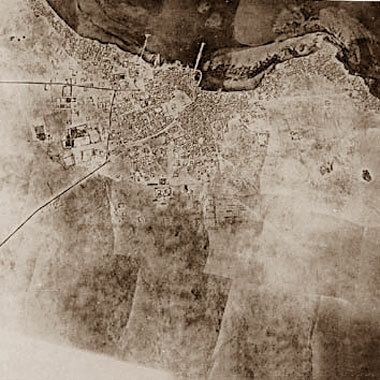 A small grey square has been drawn on the coastline of the bay approximately covering the area shown in the first photograph above in order to give some indication of the extent to which Doha had expanded in fifty or so years – at the most, this might be considered to be two generations. The purpose of including these photographs is to give a very quick illustration of what the urban structure was like only fifty years or so ago, how small the capital was in those days, and how dramatic and extensive the physical change has been in that time. I’ll look at the history of the capital elsewhere, although that is likely to be a brief review. Note how the road structure now includes not only the road west to Rayyan and that south-west to Salwa and Saudi, but a road to the north and one to the south via Wakra to the industrial town of Umm Said. Also note that the marine reefs have been taken out to facilitate movement around the old port area as well as Doha’s bay. 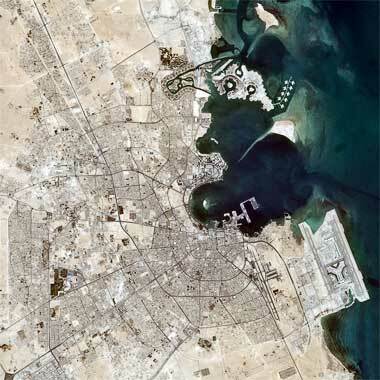 This coloured aerial photograph shows Doha in May 2005. It illustrates the rapid rate of development, particularly in the northern area of the city, known as the New District of Doha or, by some, al dafnah. The project, which incorporates canals with links to jazeerat al-Safliyah, is known as The Pearl and has been formed by dredging the shallow sea and pumping the spoil to form new land similar to the mixed residential and commercial developments seen on the Dubai littoral. It is also possible to see in the photo the extension to the port to facilitate the movement of the increasing requirement for goods and, on the right hand edge of the photo, the beginnings of a bund in which the new airport is now constructed east of the existing airport which can be seen at the bottom of the photograph. Two-and-a-half years later, in January 2008, this first photograph shows continuing development, though the photograph covers a slightly larger area from that shown above. 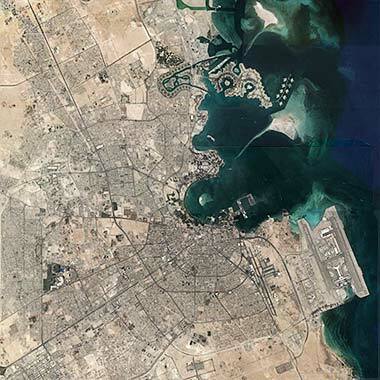 In particular it illustrates the development associated with the enlarged airport on the east side of town which is constructed on reclaimed land from the relatively shallow sea there, together with a large amount of residential development on the extreme west side of the photograph running south from al-Rayyan. The Pearl development can be seen to have developed considerably between the two islands of jazeerat al-’Aliyah to its north, and jazeerat al-Safliyah to its south. Another significant point of note is the large area of relatively undeveloped land between the housing in the west and the ‘D’ Ring Road in the east, the Rayyan Road in the north and the Salwa Road in the south. Bear in mind that there are significant areas of relatively undeveloped land all over the city. The next photograph was taken on the 5th October 2010 and illustrates another two-and-a-half years’ development compared with that above it. The Pearl development has clarified its littoral and is now better separated from jazeerat al-Safliyah. The new airport and its access road have been completed. Although it can not be seen at this scale, there is considerable development continuing around Greater Doha, particularly in the New District of Doha and the early stages of the Musheirib project to the west of suq waqf. This photograph gives an indication of the extent of Doha on the 5th September 2013. To the casual viewer there might be little difference between this image and the one preceding it, taken three years previously, but much has happened in the intervening years. To the north of Doha, on the coast, development continues above the jazeerat of al-’Aliyah, though this is not in the image here as, when I began to make these images I had no idea of the extent to which Doha would develop northwards. Development has also expanded the urbanisations of Wakra, Umm Said or Mesaieed and elsewhere off this map. This development is intended to continue, particularly with the run-up to the World Football Cup as increasing numbers of expatriate workers will need to be brought in to construct its infrastructure. As you can see from the previous photographs, the developments above have leap-frogged recent development in the New District of Doha. This aerial photograph, taken in November 2008 and looking from the east, shows how the tall buildings of the NDOD have grown to dominate this part of the West Bay. It also shows that there is still considerable room for more similar buildings, should the need arise, creating a dense, urban landscape at the point of the New District of Doha, in contrast to the much lower density development of the centre of the city and, of course, dramatically different from the residential developments seen behind the point blocks. The rapid rate of development in Qatar has been associated by many with the Asian Games, an international event that was held in Doha in November 2006 and considered to be a significant success. This was a time when Qatar was able to demonstrate to the world the scale and manner of its growth both in prestige and national terms as well as in the associated extent and pace of its physical development. Now the focus is on the World Football Cup matches of 2022, bringing with it a number of problems. By any construction standard, the pace of work being carried out in this area, far from the main centre of Doha, was and remains considerable. The rate of development here is being witnessed not only by those living and working in the peninsula but also by those having an interest in the area. In a sense, this district of Doha is one that people use to gauge progress in a number of aspects of development, not just physical, but also with regard to the economic and social changes that are being experienced in the peninsula. The photograph above of the Pearl sign, together with this set of twelve satellite photographs below it, illustrate progress on this important element of the northern area of the New District development, the 400 hectare Pearl project. The photographs shown alongside this note were taken in June 2004, July 2005, July 2006, July 2007, July 2008, June 2009, July 2010, July 2011, June 2012, July 2013, July 2014, July 2015, July 2016 and July 2017 respectively, the project having its completion originally planned for 2009. It used to be possible to see the satellite photographs, together with many others, on the Pearl website, but regrettably it appears this is no longer the case. The first photograph, that of June 2004 is very similar to the state of works in June 2003, when examining the progress of the work on Google Earth, all the photographs being derived from that source. The adjacent sequence of aerial photographs is interesting in that it illustrates, albeit at some distance, how much of the work of reclamation could be seen to be in place in order that work might proceed on the shaping of the land profiles and the installation of infrastructure in preparation for the construction of the above ground built elements of the project. Reclamation is being carried out in many different parts of the Gulf, but not always with the control that is being exercised here. In Dubai, for instance, some of the filled areas have suffered from erosion due to a slowing down of commercial interest and the concomitant pace of the funding of the planned construction works. The process of reclamation is in many ways relatively simple, but it introduces a number of significant problems relating not just to the physical character of the landfill and its servicing but, particularly, to changes in the flows of water around the newly created development. Both land and sea have to be considered together for both their short and long term inter-relationships. 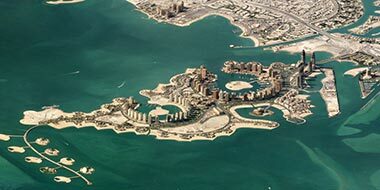 Any alteration to the natural littoral profiles, both in depth and configuration, will affect the manner in which water flows, not just around the new development, but also into Doha’s West Bay. Naturally reclamation disrupts the marine environment on and above the sea bed, but it also as an impact caused by silting, the latter sometimes at considerable distances from the landfill and often in a manner that creates difficulties for other marine and land users. In addition to the problems relating to distance there are usually more detailed but similar problems within areas where water is unable to flow through and wash out in a natural manner. Although the sea bed will be able to settle down to the required profiles, it is difficult to project how it may regenerate, and what its eventual character might be with the significant scale and range of new activities taking place on and above it, particularly with the large numbers of marine craft based within the development. Prior to the work going ahead there was an investigation into the ramifications of the dredging and an establishing of the constraints to the work. It has been claimed that there has been a positive effect from the dredging, though in environmental terms, this might be considered far too early to make an assessment of long term changes both in and immediately adjacent to the development as well as in areas further afield. Because of this, it will be interesting to see how the flows of water and the character of marine life will be changed in and around Doha’s West Bay as a result of the joining of this development with the island of al-Safliya. It is also possible that these may be altered outside and to the east of the area, though that is an area which has been dredged for the reclamation. The Pearl development continues to grow apace with each passing year witnessing a settling in of the buildings with their different uses, work force and inhabitants. While these annual aerial images reflect a little of the continuing physical development, it is really in the detail of the works in this area of the peninsula that most of the progress is to be seen and, at this scale, that detail is difficult to discern. However, it seems useful to see as a record of the work that has gone into this major project. These images can only hint at them and should be viewed together with images on the ground which can be found elsewhere. This photograph illustrates the intended plan of the completed project. You can see that there is a small lagoon facing north and two small lagoons facing away from the southward-moving littoral drift. These three lagoons each have a small island in the centre with bridged access to them from the main island. Provision appears to be made for boats in at least two of them which means that there may be traffic problems as well as cleaning problems associated with waste. Looking approximately north-west, this aerial photograph gives a good indication of the extent to which the Pearl development has grown by April 2011 showing, particularly, something of the three-dimensional quality of the project. There are still a number of sites to be developed along the coastline and as yet there is no landscaping, but the physical infrastructure can be seen to be moving rapidly and I assume the housing and associated support facilities have been identified and are planned to follow. The coastline appears to have been completed and there are now some boats moored in the central marina. Here is a different view of the development, the image having been made from a satellite looking down approximately south-west over the Pearl development and showing a little more buildings in the six years since the previous image. The image was taken on 11th November 2017 and gives a good indication of the different heights and densities between the developments surrounding the artificial bays, and the developments on the mainland. I don’t know what studies have been made for the project but note that the development has a heavily articulated outline. This, the proximity to the coast and the enclosed nature of the lagoons suggest there may be difficulties with time in the silting of the coastline and canals in an unforeseen manner. This is a problem which was experienced in Dubai as the littoral drift caused both the scouring away of the shoreline and the depositing of sand some distance away by the natural action of the water. It was also a problem in Wakra where the silt travelled south, down the coast, eventually blocking easy access to the sea. The accompanying photograph, taken in May 1976, shows how close the littoral drift brought the silt to the shore line. Although studies are usually made for projects of this nature, it is not always possible to model them accurately and there is always the possibility for dead water to be created. There are some notes on the settlement of Qatar on the history addendum which might be read in conjunction with the notes here. Because of the relatively brief time in which there have been permanent structures in the peninsula it is difficult to describe a process of development. There has, of course, been development in the peninsula stretching back over a thousand years but the structural systems that might have been used have not been fully determined. It is suggested that coastal urbanisation of the Qatar peninsula took its styles and constructional techniques from these areas, whereas the interior of the peninsula was more influenced by the architecture of the Arabian hinterland. Certainly there was continuous trading by traditional craft moving along the coasts of the region as well as crossing to Persia. The crews of these craft were of as wide a variety as the areas they visited. Arabs, Africans, Persians and Indians made up these crews and would have been likely to settle in the peninsula as we know that early travellers to Qatar noted the presence of twenty-five groupings. Both on the coast as well as within the interior, courtyard houses appear to have been developed as a natural preference. Elsewhere I have suggested that this would have both in response to the environmental conditions obtaining in the peninsula as well as the need to provide privacy and security for the family. The tall buildings of Umm Salal Muhammad are markedly different from other buildings in the peninsula and represent a second form of architecture. They are more developed and, as such, are more similar to the urban architecture of the developed centre of Doha. There are two structures near the North Road which are thought to be watch towers though the proximity of two such towers seems to militate against their usefulness as being only watch towers. But in the village itself, there are a small number of multi-storey structures which I have been told were residential but obviously had a defensive character while retaining internal courtyards. Set in a declivity of the contours, the buildings are associated with a water source and agricultural area, prime resources for the development of urbanisation. Whatever the architectural characteristics are in the region, the key to an understanding of Gulf architecture is to begin with the basic unit: the household. The illustration below is of the refurbished house of one of the better-off merchants in the centre of the capital of Qatar, Doha. It was the only house in the centre which had a wind tower, a device to bring down the winds within compact urban development, though you can see that a replica has been recently constructed to its side. Now rehabilitated as a museum, the old building sits surrounded by open space, a travesty of its original design. You must try to imagine it surrounded on all sides by narrow pedestrian thoroughfares, their floors covered in clean suban, shell sand, and with similar buildings – though, in this case, no wind towers – surrounding it. Occasionally the passageway system was relieved by covered or high-walled walkways at first floor level crossing the pedestrian paths where they connected buildings in the same or joint ownership. Although this was the house of a prosperous merchant and was larger than many of its neighbours, it can be seen to encapsulate the basic requirements of a relatively sophisticated residence in a tight urban setting. From an urban design point of view the household is private and should not display itself to the street outside. Only one or some of its external walls will face the street and that is maintained in as unassuming manner as possible. If there are openings other than a door, then they must be screened and it should be impossible to see into the area occupied or used by the household. This is also true for door or gate openings which usually have screen walls behind them guarding the privacy of the household. In the example above you can see windows at ground floor level guarded by vertical iron bars and internal wooden shutters. These are the windows to the majlis, that area of the house which is open to male visitors. Other openings which are visible are screened by mushrabiyat, perforated plaster panels, or by badgheer – recessed planes which help channel and direct air movements into the building and onto the roof where, in the old days, many used to sleep at night. Privacy is paramount in Islamic households. The key point to understand about the manner in which Qatari houses are used, is that there is a significant separation of the male and female areas of the house and its plot. Certainly a difference in scale of the house can make the layout less or more complicated, but all houses should fulfill the illustrative privacy diagram set out below. The notional diagram to the side illustrates the basic requirements of the house on its plot. It might be usefully read in conjunction with a diagram lower down the page that shows relationships together with another diagram illustrating conceptual privacy relationships in and around a notional Qatari house plot. In order to make this diagram more understandable I have set it out for a well-off family with servants and animals. Having said that, bear in mind that many less affluent families are large and will have a servant and, certainly, animals. In addition it should be borne in mind that many residential developments have considerably more spaces, both internally and externally, associated with them. For instance there will be a dairy in many residential developments where milk and yoghurts are produced for the family. In the men’s area of the house, there will be accommodation where guests can live when visiting. Sometimes a guest will sleep overnight on the floor of the majlis, but at least one room with associated bathroom facilities would be a preferred solution. In some cases the study might resolve this problem, but it is likely to have private or secure associations making it unsuitable for housing guests. I should also mention that there are different attitudes to dealing with refuse. Here its storage is shown inside the compound when it would be anticipated that servants will take it out for collection at the appropriate time and day. This would reflect an owner’s desire to keep the front of his property clear. However, many keep the refuse outside the property wall with apparently no concern for its look and smell. I won’t go into the relationships here as I intend to look at them elsewhere and explain what can and what can’t be altered. The reason why the above diagram is important here is that it demonstrates, or should demonstrate, the manner in which the house and its site are laid out in order to provide for the degrees and extent of privacy essential to living in a Gulf house. Having said that, as might be expected, the relationships are not absolute but represent my experience of many different Qataris and their preferences. In particular it protects the family even as expanding contacts with external influences might be thought to weaken the cohesion of Qatari society. What disappoints me is that nowadays so few houses conform to the basic requirements of this diagram, and that privacy is compromised to the disadvantage of the household and, significantly, of the women of the household. This holds particularly true for the external spaces contained within the boundary wall. This diagram can usefully be read together with the diagram above that illustrates relationships within a Qatari housing plot. This diagram was designed to show the differing strengths of relationship between different rooms and utilities within a housing plot. As with the diagram above, this was drawn at the beginning of the 1970s and, in some respects can be seen to have been overtaken by events. However, both diagrams are useful when looking at the history of the Qatari house and, despite the passage of time, many aspects are still correct, particularly those relating to privacy. Of particular note is that I have set out the rooms with Western names associated with them as this reflects the manner in which Qataris now expect to use their houses. In the past rooms were just spaces and might have a number of alternative uses both within a day or with the seasons and special events, or just over time as the family grew or changed. The essential difference between the past and its traditions is that, historically, the spaces were related to degrees of privacy, but now, they are specific. Part of the reason for this is the growth of affluence and the concomitant ability – and desire – to purchase the wide range of goods that line the showrooms and for which there is now considerable purchasing power. It should also be borne in mind that the goods in the retail markets are, for the most part, designed for Western tastes both in the design and decoration of the items, but also in their appropriate consideration for the socio-cultural situations in which they are to be located. Of course, there are differences in some cultures. For instance it is still rare to see Japanese baths and water closets in the West, both these items reflecting specific cultural practices. the degree of comfort in terms of noise and nuisance. leads you to the public street. In Tunis and other cities, at the entrance to the house there would be a small room off the main thoroughfare or blind alley which served both as a semi-public space as well as a majlis, privacy to the rest of the house being maintained by further turns or screens. In Qatar there were both blind alleys and public thoroughfares onto which houses opened. In each case there was usually a space incorporating either a dog-leg or right-angled turn in order to provide privacy. Two further points are worth bearing in mind here, firstly that the positioning of the doorway to a house was often a concern. Generally it was felt that there should be no opening of one door directly across from another, even on large streets as there was an argument that harm might or would result. By this they appear to have been thinking primarily of privacy, but there were also arguments relating to the uses that might develop adjacent to the opposite entrance, particularly commercial. Sometimes a complicating issue was provided by the rights or duties incumbent upon the owners of properties, as these varied with the owners’ position with respect to the entrance of an alley. The second point to make is that, in writing about the entrance to a property, I am essentially referring to the men’s entrance. In the majority of cases, certainly in Qatar, the main entrance was the only entrance, however in many parts of the Islamic world there would be a family entrance used solely by the women of the family. I should also add that, in some countries, there might be internal connections between neighbouring houses for the use, again solely, by the women of both houses, this arrangement not being made only within extended families, though this would be the main case. In this photograph, I believe that the family entrance was on the left and the majlis on the right. I mentioned the importance of having a property fronting onto a main road as in this photograph. Here the opportunity has been taken to make a classically symmetrical arrangement of central, vehicular, gates with adjoining covered pedestrian gates flanked by windows, notionally allowing a degree of observation or security over the entrance. What I find interesting here, though, is the style of architecture which lends a Mughal influence to the street. However, times change and, with an increasing choice of materials, sometimes there is a hint of mystery as with this photograph where children could be seen playing behind the gate, and sometimes there is an apparent lack of concern in absolute security as can be seen in the illustrations below. This has much to do with the overall security felt by the residents of areas in which they have had a say in the layout of the area. What is noticeable is that in areas that seem to be considered safe, the vehicular or service gate to the property is often left open and a part of the garden or site is visible. This area is usually the semi-public or even semi-private part of the site, particularly so when access is gained through it to a majlis within the property. But, in leaving the gate open there is a significant change in the character in the area. There is now a more sociable link with the community with the introduction of more visual elements within the site. Even when there are no lights welcoming visitors to the site, leaving the front gate open – as in the lowest photograph – still softens the transition between public and private areas, even when there is nothing but hard surfaces to see. In this and similar areas, there is a joining of the site and the adjacent road, reinforcing the owner’s relationship with the space outside not only in terms of access but in use. Children move in and out of the property, women visit family, servants move between houses taking food or can be seen watering, cleaning or maintaining elements of the site; men move to and from the mosque and there is a settled sense of ownership by the community of ‘their’ neighbourhood. The only negative thing I can see in all this is that there is now a heavy reliance on the Municipality to maintain the area outside the house rather than the owners dealing with it themselves as would have been the case a generation ago. This is likely to be both a reflection of the lower density and, therefore, the greater costs of maintaining such spaces; but it also illustrates a change in attitude to the area adjacent to the house by the owners. It may be seen as a form of political pressure they seem happy to apply upon the Municipality, but the State, through the Municipality, actively seeks to take this responsibility upon itself as a service to its population and a way of distributing some of its wealth. The main difficulty in this is that there are considerable amounts of rubbish created by households, much of it food which can be messy, a source of unpleasant smells and an attraction to vermin as well as, in this case, cats. Cats, incidentally, are found all over Doha and other towns in the peninsula, and are likely to be some help in keeping vermin down. However, they have to lead an ambiguous existence. Loved by the Prophet who had a cat named Mu’izza, they are not treated as house pets as is mostly the case in the West, and do not appear to have much of a happy existence. But because of the link with the Prophet, they can not be put down as have been dogs which many consider to be unclean – though this view is debatable – and used to roam the streets in large and dangerous packs. The main point to make here is that the public area immediately outside the house now tends to be compromised by the State’s refuse bins and the nuisance they create. As yet there seems to be no good solution to the problem, but elsewhere an approach to the problem is discussed. Sometimes there is confusion in that the main entrance to the property is the entrance to the majlis and the women’s entrance is through the service entrance – usually the vehicular access to the site. In this case there is definitely a conflict between the private and public aspects of the site to the disadvantage of the women of the household. Front gates are an important element of design in the urban landscape. Originally gates were made of teak and were narrow and pedestrian oriented. The first large gates were associated with shops in the suq and, again, were made from timber. With time it became necessary for large items to be brought onto household sites, and this was effected with wood or steel gates as that material became more common and affordable. Cars, which you would anticipate being brought onto the household site, were generally left outside the property, this from a mixture of pride and the lack of space in the tight urban grain of the old town. It was only as households moved onto more spacious sites that large gates became necessary and, in these cases, they were invariably fabricated from flat steel with welded bars for structural rigidity. These first five photographs, all of them taken in the early 1970s, illustrate a number of different doors with the intention of showing a little of the character and range of designs used for residential entrances in the early developments of the 1950s and 1960s. It is not claimed that these doors reflect the full range of designs, but they certainly demonstrate something of the treatment owners gave to their frontages in their first forays into the use of colour. The outside two doors in the group of photographs above show the same design but with each having a different paint treatment. The central design in the first photograph is significantly different both in design and colouring. Interestingly the patterns in the outer doors are each irregular and it might be instructive to wonder why this might be. The door in this photograph also uses the same pattern but has three rosettes rather than two as in the examples above and has the same paint treatment extended to the adjacent window and door. Many of the doors were of a standard design, the paint treatment introducing personality to the door. What is significant about this trio of doors is that they all fill the full width of the doorway but have a wicket door set into them in the same location, very much in the traditions of the peninsula, but only the wicket door is openable. Note also that there is no ventilation grille at their heads and that cylinder locks have been incorporated into the doors. Before steel plate and strapwork were introduced to the building industry, doors and gates as entrances were fabricated out of wood, usually teak planks fixed together with wrought iron nails combining to produce extremely strong doors. There are some notes here relating to these traditional timber doors, and showing something of their design and construction. Security has always been a concern for those living in Qatar. This applied both to those living on the coast of the peninsula as well as in the communities of the interior. With the increasing wealth, and the beginnings of expansion of building development in the peninsula, new materials became available and affordable to those with a need to construct improved houses and commercial premises. One of the most significant changes was the move from timber to steel in the materials used for the manufacture of windows and, particularly, for doors and gates. Most notably these were associated with residential properties, but they were also used with the intention to provide improved commercial buildings, a burgeoning industry developing to create the doors and gates from welded sheet steel and strapwork. The next three photographs show eight pairs of doors all of which have the traditional ventilation grille over them, though admittedly the top central door seems to be more of a left-over space than an intended grille. Having said that, close inspection of the original photographs in the lowest two examples suggests that there were, at one time, an opening above both doors, and which were later filled in. All eight doors – apart from the lowest left one, which is of the same pattern as the three at the beginning of this note – are arranged as pairs of double doors. As such they may represent a later type of door from the three illustrated in the first photograph above which, while none of them incorporating an ’enf, have a version of the traditional wicket gate incorporated within them suggesting that this may be the earlier model. All the doors are of a different design and illustrate a trend to having their designs made to order, albeit generally simple within the constraints of the need to have the doors structurally sound. In my opinion, only those which are based on diagonals and curves suggest anything of the traditional architectural vocabulary of the peninsula, this view being supported in the earlier steel gates with wicket gate. It should be noted that t he steel angle surrounding the panels gave a degree of support but the doors were usually flexible as well as being noisy in operation. The central door above is a particularly attractive design. It is impossible to say where the design originated, though my guess would be the Indian sub-continent even though my observation was that many of the sheet metal workers were from Iran. What is particularly attractive, and is shown here, is the cursive religious exhortation incorporated into the ventilating strip above the door, though it is let down by a conflicting pair of decorative steel straps welded behind it which conflict with the design and are unnecessary for either structural or security reasons. These next two photographs show something of the typical construction of the old steel gates, many of which still exist around the country. The basic pattern is illustrated in these photographs and is fabricated from steel straps usually spot-welded onto the steel plate door as curvilinear arches established on two diagonally crossed lines set within a squared arrangement. The square with its diagonals is obviously the most economical way of providing bracing to the sheets, and the curves can be seen to add visual interest, evidently a first essay into relieving the angularity of the basic pattern. This appears to be the design most commonly found on these doors and gates, the pattern being seen everywhere on both old and new main and pedestrian gates on the front boundaries of properties as well as on some internal doors, usually in areas of a more functional purpose, perhaps associated with storage, frontage shops and the like where additional security is required. The bolt and lock arrangement, reflecting the traditional arrangement for a mazlaaj, was typical of these early gates and appears to be the preferred way of providing security prior to cylinder locks being incorporated into the gates. In many of the photographs of these doors it is interesting to see the approach to colouring in the many of the panels and, in this photograph, how the two paints have deteriorated at different rates, creating a textured contrast which created additional interest on many of the older steel doors. Here is a more modern version of the above geometry. The designs were also sometimes used on the doors of buildings where there was considered to be a more functional requirement, such as the door which commonly gave access to staircases from the outside of buildings. This photograph shows a little more clearly how the gates were and are constructed. This detail of a new and much larger gate to a property in Doha. You can see a horizontal line which shows that the gate was welded together from flat steel plate, onto which steel straps have been welded. As you would expect, the gates are heavy but they are not very rigid even with the strapwork to stiffen them. This tends to be true even of the smaller gates such as that illustrated with the previous paragraph. It is worth illustrating a more up-market flat steel pair of gates, these dating from the middle of the nineteen-seventies. The photograph illustrates a more accurate construction, though otherwise the pattern of two side-hung leafs with a wicket gate in one of them is a standard design, even when there is a separate pedestrian entrance gate to the property. The decorative pattern, based on eight-point geometry is not unusual, but nowhere as common as that shown in the photographs above. It was common with the early buildings to provide steel grilles over the windows for security, a recurrent concern of Qataris despite the relatively crime-free character of the country. This photograph shows the typical pattern constructed from steel in the burgeoning steel fabricating workshops that sprang up all over the outskirts to Doha and other towns. The pattern, together with that shown on the gate in the photo above it, are both derived from and typical of the traditional naqsh designs found in the peninsula. These sheet steel entrance gates have been a feature of residential developments for a long time now, and were a significant boost to the welding industry from the nineteen-fifties when many one-man shops opened up. Although the majority of these doors were geometrical in the patterning of the stiffening strips, there was an occasional burst of artistry employed in their design. One such is shown here, with the themes of planting, stars and a gazelle beautifully executed. With its obvious origins in the Indian sub-continent and, perhaps a degree of nostalgia, it is an example of the type of creative, individual design which enlivens and gives added interest to those moving around urban environments. This pair of gates appears to be of a similar age to those in the photograph above, the photograph dating to the early nineteen-seventies. The subjects are similar, a gazelle, stars and stylised plants, the latter interestingly contained in a planter rather than in the ground. The gazelle is not as artistically designed as in the previous example, and the painter has given it a stippled effect. From a construction point of view the gates are not as stiff as those with the gridded strap welds shown above, but the design is attractive in its naïve execution. Here are an unusually decorated pair of doors set at the pedestrian entrance to a property in the old inner ring of Doha. The moon and star motif is a prominent feature of the top corners of the gates, but the main focus is on the stylised date palms that are enlivened by the treatment of their trunks in a truly idiosyncratic manner. There appear to be stylised rocks at the foot of the gates that balance the treatment of the top of the gates. Again, this is an attractive addition to the local street. This first photograph is of two pairs of entrance gates were found in Medinat Khalifa in the middle of the nineteen-seventies when this housing area for Qataris had been completed and the roads finished. The tarmac can be seen leading up to the gates and was used as the finishing material for the whole of the ground between facing properties, there being no paving laid there. The gates are of the standard design pattern. There are slight differences in the numbers of sub-divisions of the panels, but the main distinctions were provided by the owners and their painting schemes, significant efforts being made to have different treatments from neighbours. This is a more unusual gate, not only in the pattern into which it has been sub-divided, but also in its colouring of red, orange, yellow and black with the straps picked out in white. The irregular pattern has the effect of creating a more vivid gate and one which creates a point of interest, contrasting with the commonly long boundary walls. They are one of the few areas in which house owners can demonstrate individuality. While this may not accord with strict Islamic interpretations it is, nevertheless, a very human response to the provision of similar housing units. The local approach to the selection of colour is intriguing in that there seems to have been no rationale to the selection of colours and their application. In this detail of a painted steel door the colours yellow, green, white and black – the same colours as are used on the gate below – have been used in what appears to be an illogical manner, but one which has the effect of creating a more interesting design to anybody close to the gate. This photograph was taken in feriq al-Salata in 1973 and illustrates a more free-form design patterning from those shown above in Medinat Khalifa. The patterning and, in particular, the colouring of the gates is asymmetrical, again a characteristic that livens this part of the urban environment which in this part of Doha was essentially sand-coloured. But it is the treatment of the circular columns that is more unusual. A significant freehand attempt has been made to produce a spiral treatment in three colours, green, yellow and black, the eccentricities adding interest to the overall treatment of the entrance gates and gateway. Generally it is only the gates that are painted, but there seems to have been a trend with some owners to extend the painting to the area immediately surrounding the gates as is illustrated both in the photograph above and in this, more extreme, example – both photographs having been taken in 1973. 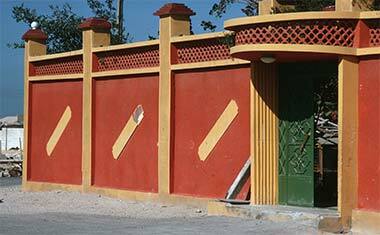 Here, pale blue, yellow and brown have been used to colour the patterned gates while, unusually, painting has been extended to the surrounding blockwork in an irregular pattern which appear to have little or no geometric form in either its shapes or their positioning. Incidentally, the bicycle suggests that the house is occupied by expatriates from the Indian sub-continent, which will account for the design motif, though not explain it. Compare the above entrance gates with these, admittedly, more up-market pair. 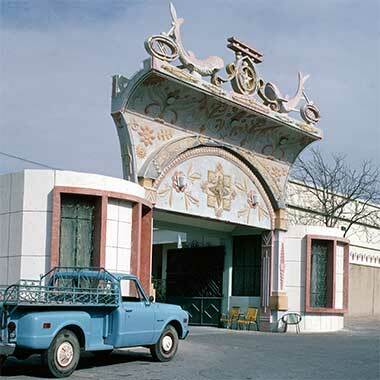 This entrance is on a building constructed in the 1960s and illustrates an approach that was common at that time with decorative motifs introduced from northern Arab states, particularly the Lebanon and Egypt. Here the steel strapwork is organised symmetrically about the centre vertical axis, as is the applied decoration on the surrounds which are an inventive interpretation of a floral display in a vase. Some of the old gates can look like modern works of art. Here are a pair of gates with a wicket door that have an Art Nouveaufeel to them. They might even be thought to resemble a face with the curvilinear strapping having the feeling of a pair of eyes. But, again, if you look at the manner in which the sub-divisions have been coloured, you can see the eccentric paint selection has brought additional life to the irregular pattern of the strapwork, even with these faded colours. These two photos are of houses for Qataris, and illustrate the character of development in the eighties and nineties, the lower design being more up-market than the upper one. There has been a tendency to cover gates with a notional structure to enhance their importance. There is rarely any functional need for such a covering as they are rarely large enough to protect from either the sun or rain. However, sometimes an entrance structure is introduced for security purposes when a vehicle might sit under it for some time, but this is only seen on large developments where there is a real need for security. In these circumstances it it not unusual for there to be a dikka associated with the entrance way. This pair of photos illustrate an apparently rising trend, that of glazed doors. It is a strange arrangement in some ways. Traditionally, timber doors incorporated a wicket gate for normal, everyday access, but the door in which the wicket gate was set could be opened if there was a need to move a large object through it which was too large for the wicket gate. The principle might be the same here, though I suspect that it has more to do with the opening being thought, later, too large to hang a single, heavy door. There is also the design decision relating to scale of single or double doors, but I suspect, perhaps uncharitably, this was not an issue here. Neither the door above nor these two bear any resemblance to Islamic design in the Gulf. The upper of this pair is poorly considered in design terms with its curvilinear elements unrelated in scale or positioning to the orthogonal elements of the gate. However, I have to admit to a sneaking admiration for its eccentric exuberance, unrelated as it is to Islamic design. Regrettably, I don’t know whether it was the architect, client or a workman who was responsible for the design. Sometimes works such as this are purely the realm of the craftsman carrying out the contract. The second detail is equally impressive but of a different artistic order. Its fine workmanship, backed by obscured glass forms a very attractive pattern, albeit one based again on foreign influence rather than being locally inspired. This pair of vehicle entrances show the kind of structures provided in the nineteen seventies for ex-patriate housing. There is little or no privacy and substantial savings could be made by keeping the walls and gates relatively low. Compare them with the gates for Qatari houses above and notice that the owners have added steel sheet behind the railings to maintain a little more privacy for their gardens, but not sufficient to screen the windows of the house. Gates are one of the areas in which owners have been able to show some individuality. In areas such as Medinat Khalifa where the gates were provided by the Government, owners were able to show individuality by the patterning and colour of the gates. Nowadays there is a wide variety of decorative treatment available, and used. Here, for instance, a lion boss and two profiled lions with a hint of Assyria about them, mark the individuality of this house – which is not, of course, a Government house. The doorways and gates above illustrate a little of the thought that goes into them from a design point of view. But here I have added a photograph of an old entrance gate which has had bougainvillea trained over it. In many ways this is typical of many of the older areas of Doha. The planting has at least three functions: firstly it adds colour and movement to the urban scene outside the boundary of the house; secondly it produces shade for those standing or sitting near the entrance and, thirdly, it adds an element of security as bougainvillea has thorns and would be difficult to climb through. In general, planting also introduces wild life to the area and improves the microclimate. This type of landscaping is a real benefit to the neighbourhood. Finally, I’d like to note one issue that has been mentioned to me a number of times but for which I have found no documentation: that is the direction taken on entering a house. A number of people have told me that, on entering a house, you must turn to the right – usually, in modern houses, the entrance to the majlis. They have not been able to rationalise it for me, saying only that it has always been that way and implying bad luck if you don’t. The only rationale for this that I can think of is that it reflects the arrangement that fortified buildings had in the past. In those buildings the defender would be right-handed and have his sword swinging on that side of his body; a right-handed turn would give him advantage over a similarly right-handed swordsman advancing on him. This arrangement is well known, even to the extent that the Scottish Kerr family, who were all left-handed, arranged their defensive buildings to suit their left hands and constructed their building turns to the left. I know of a small number of majaalis where the entrance to the majlis is to the left but certainly, in my experience, the majority are to the right. This also applies when the majlis is a separate structure and not part of a house. I have also noticed that the owner of the majlis tends to sit either at the middle of the far end or on the right. I don’t know if it’s worth mentioning in this context but, in the blind alleys of the medina at Fez, where there would be a number of families living around each alley and related by kinship, the hierarchy of the families would locate the most important one at the head of the alley, that is at the farthest from the entrance to the alley from the public thoroughfare. This is precisely how the Sulaiti qabila arranged themselves when they moved from Feriq al-Salata to their new lands outside the ‘C’ ring road in Doha. seating on the floor comprising dowshek, cotton-filled matress and misnad, cushions to lean on. a bowl of warm water where they would be rinsed. small glasses for the production and presentation of tea. Lighting originally would have been by kerosene lamp which would have marked the walls and ceilings with soot. Later, tungsten light bulbs were face-fixed to the walls or very unusually, suspended from the ceiling. Most majaalis made provision for the hanging of coats on pegs or awtad set directly into the columns. These were made of turned wood and decorated with bands of paintwork. Usually, one or more of the spaces between columns would be set aside for storage of coffee equipment, mabkhar, midakhn – incense burners and the like. In those cases it is likely that the recess would have a solid back and there would be no window. In accordance with tradition there is also an area ouside the boundary of the site where guests can be entertained. The reasons for this are dealt with elsewhere but it is as important an area to the operation of the society as the enclosed majlis. They can be thought of in socio-anthropological terms as the same space. Here are some photographs of majaalis. 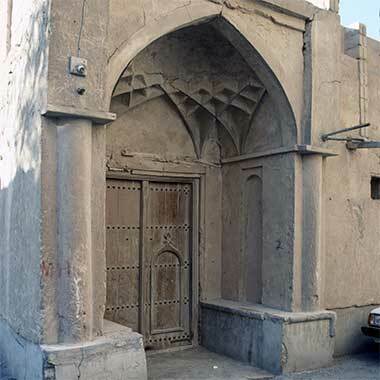 The first photograph is of the corner of an old majlis and is typical of the first generation of formal majaalis of the latter half of the last century indicated not just by the style of furniture, but also the aluminium sliding windows. The size of the room, the high ceiling, wall sconces and chandelier, out of sight, together with the cool green decor indicate a majlis of importance, though disused at the time of the photograph. This next majlis is typical of many modern Qatari majaalis. Smaller than the example above it includes most of the usual contents of a majlis. It is lined with peripheral sofas and armchairs, their heavy style being representative of the furniture in most majaalis as is their patterning. Plain designs are very rarely seen. Next to the seats there is the standard requirement of a series of small tables to take tea cups and glasses of water, fruit juice or soft drinks through the evening. Sometimes you will see there a Quran and prayer beads, and newspapers and the occasional magazine are not uncommon. You can also see at the rear left of the photo a calendar. This is an Islamic calendar and is a feature of many majaalis. I understand they are there to ensure that the owner and his guests know the times of prayers. There is a television to keep up with the news and I think there was also a radio/cassette player out of sight. A telephone was located in the corner where the owner habitually sits. Incidentally, in larger majaalis there are often more than one telephone but they will all be on the same line so that there is no breach of privacy by somebody picking up a telephone out of sight. In the wall there is a standard air-conditioning unit with its timber surround and trailing wire to the wall mounted socket outlet. Where possible owners now prefer split units or, better, a proper air-conditioning system with ceiling mounted grilles preferably integrated into the design of the ceiling. The lighting is fluorescent from ceiling mounted fittings, and sometimes there is fluorescent from behind a suspended acoustic or plaster ceiling but, where possible there seems to be a predeliction for chandeliers in gold and crystal. You should also take note of the omni-present tissue boxes, a feature not only of every majlis you enter, but of every room in a house. These tissue boxes appear to be as they were bought but the majority I’ve seen are inserted into elaborate containers with a variety of artistic treatments. The floor has a fully fitted carpet with a long pile and in the preferred colour, beige, on top of which there is an mechanically woven Persian carpet. One of the features missing from this majlis are wall pictures. They are not always found in majaalis – as they are not always found in houses – but they do sometimes appear. Where they do they tend to be romanticised landscapes, often of trees and hills but I have seen original oil paintings of ancestors, taken from photographs, both portraits and composed in a traditional setting. This photograph shows the dining area associated with the majlis above. 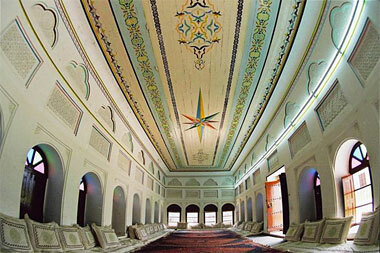 In many ways it resembles the traditional majlis lined as it is with masaanid in the traditional style. It is the way in which majaalis were organised in the past and is still liked by many. In fact, when people use armchairs and sofas in modern majaalis they often end up sitting on the floor, using the front and seat of the sofas and armchairs as masaanid. I have seen a number of majaalis furnished like this, but it is a dining room. In the background you can see a wash area where guests can wash after their meal. Commonly this will have a tiled floor and the water in the sink may be left running so that guests can more easily wash themselves after a meal eaten with their hands. When it is time to eat a sufra will be placed on the ground and the meal set out. Guests will come through from the majlis and the host will begin the process of making sure his guests are well provided for. At the end of the meal the diners will wash and retire to the majlis where coffee and then tea will be brought to them. This photograph has been added as it illustrates a development of the traditional arrangement of dowshek and masaanid that are found in khayaam and majaalis, into more formal seating units. Tents arranged for tourists at the Inland Sea have been provided with seating that replicates traditional character in being set on the ground, but does so in a way that has much to do with the formality of Western furniture in this case, sofas. What particularly interests me is that the masaanid forming the arm rests are substantial and designed for resting against in the traditional relaxed manner, while those at the back of the seating do not really support leaning against as they would on a Western sofa. In some ways similar to the example above, this majlis illustrates an interesting seating development. It is located on a farm that has been developed as a recreational area for the Qatari family to whom it belongs. The majlis is sparse with simple decoration, but demonstrates a lot of the features that illustrate its traditional roots. It is a good example of a family creating a majlis that suits not just the entertainment of male friends, but also guests to the farm though, of the two, it is definitely oriented towards informal enjoyment of this formal space. The most interesting element to note is the seating which has been custom made for the room and is a cross between a traditional dowshek with masaanid and modern seating in terms of its relatively low level. It is designed to be sat on in the traditional manner and is likely to be an extremely comfortable alternative to a sofa. Here is another modern majlis which has a slightly different feature from the normal type. The fitted carpet with a central rug, curtains including sheer and peripheral seating are all standard, but the difference is in the positioning and character of the owner’s seating. Instead of it matching the other seats in the room, it is located in the corner across from the entrance and consists of three chairs of a different style – one of them being larger than the others – together with side tables and a front table with telephone and tissue box. There are two small pictures on the wall together with a standard, wall-mounted air-conditioner which is slightly surprising as, close to, they tend to be noisy and too cold. These two photographs are of a majlis that has been described by the son of the owner as a sitting room and appears to be a cross between a Western sitting room and a majlis. They illustrate how the traditional majlis is moving away from being a room with a lot of seats to one that has been furnished and decorated for effect in a style that has little or nothing to do with tradition. This suggests that there will be less people visiting, but that they will be more comfortable when they do. It also implies that men and women might use the room, an increasing trend with families who have a wider national background, particularly those that have married foreign nationals from countries with less formal traditions relating to the meeting of men and women. Note that there appears to be nothing in the room that relates to an Arabic or Islamic background, except the Persian carpet. Even the geometry of the ceiling is non-traditional. Compare the majlis above with this ladies’ majlis. There are three sofas which will take perhaps a maximum of eight people. There are some items of decoration including a corner display cupboard and pictures. But there are not one but two wall-mounted air-conditioners to keep the room cool. Conceptually this majlis is traditionally laid out and replicates a men’s majlis in its peripheral seating. The main difference is in the amount of seating which suggests that it is not used by many people. The development of new housing, both for Qataris as well as for expatriates, is creating a variety of arrangements depending upon the extent to which the family breaks with the traditions associated with privacy. The arrangement shown here represents very much a modern expatriate arrangement, yet might be used by the family side of a Qatari house for them to use on a daily basis, and to entertain friends and relations. But it is unlikely to be used by the men of the family as it is very much a family oriented space as can be witnessed by the large number of photographs on the credenza on the far wall. If this was a Qatari house there would also have to be a majlis for the men. The seating is peripheral as in a majlis, but the space behind the far sofa has a dining table and chairs as well as the credenza behind it. This might be used for formal dining, but is more likely to be used for informal dining, this feeling reinforced by the signs of a meal on the low table in front of the sofa. Although there is the edge of a television on the right of the photograph there is a telephone on the small table between the two seats on the right, illustrating that this is the seat preferred by the owner. From experience this seems to be a curious place to sit when the obvious place would be adjacent to the far sofa, looking towards the entrance to the room, from which this photograph was taken. As you would expect, not all majaalis are the same, of course. This photograph shows an interesting example of a modern style of majlis. The windows show that it is a relatively new building. There is an air-conditioning unit at a high level adjacent to a Persian carpet with a calligraphic theme, a lovely way to display and appreciate a carpet. A modern, large-screened television sits in the corner with feature lighting behind it and surrounded by planting and, to the right, are dowashek and misaanid, the favourite way of sitting in a majlis. Above, I stated that not all majaalis are the same. Although I was writing about internal majaalis, the same is true of the informal majaalis that are to be found around the peninsula, often outside houses that do not have an external sitting area. By this I am not referring to the baraha which has a more formal construction and location, but arrangements such as these two, both found on the old fishing jetty, north of Doha’s suq. Government House can be seen at the back on the right. Somebody has taken the trouble to find upholstered chairs, sofas and tables, transporting them to the jetty with the obvious purpose of creating relatively formal majaalis within an informal setting. I assume that some of the local fishermen or boat owners use them for relaxation. The orientation of the top one faces south, but the lower, facing west, suggests that it is used in the morning or at night as, in the summer months it will be uncomfortable to sit facing the sun. I’m a little surprised that neither of them has been arranged to face north, where the best view is to be found – across West Bay to the New District of Doha. Nevertheless, informal interventions of this sort do much to enliven the public realm not just for those using it, but also for those moving around it. They are important elements of the socio-cultural traditions of the area. At first sight, this red sofa standing in the open against a wall may not look like the setting for a majlis and, perhaps in formal terms it isn’t, but it certainly fulfils some of the requirements that distinguish informal majaalis within the country. The two bicycles beside it suggest that they, and the sofa, belong to expatriates, part of the workforce that lives and works in the peninsula. Just as Arab nationals need a place to sit and discuss the affairs of the day, so do expatriates. Many of them have bonds resulting from their coming as groups from specific places abroad but, wherever they come from individually, there is a basic need to sit at the end of a day and exchange news and views while sharing hopes and information. It is not easy for many of them, working in a foreign country, and it is in locations such as this they are able to enjoy some degree of relaxation, a focus for both individuals as well as for their national group. In this sense, the sofa represents many of the aspects a majlis provides for those using it regularly. While the majlis system is shown to operate both indoors and outdoors as is witnessed by the above two photographs, majaalis operate everywhere reflecting not just their operation during what might be thought of as leisure hours but also, as witnessed by this photograph, places of business or work. Here the crew of a visiting ship sit on the foredeck, automatically forming a hollow square, having first taken off their shoes. Before leaving the subject of majaalis, where I have dealt mainly with its more commonly accepted meaning of an internal room set aside for meeting guests, mainly men, I thought it might be useful to leave a reminder of another common location of the more informal majaalis, the dikka. In common with the example above, the dikka outside this old compound on the Rayyan Road satisfies the need for people to sit and watch the world go by while they exchange news. Note that the person sitting on it does so cross-legged. This is common as the seat of a dikka is higher than a Western seat, and can be otherwise uncomfortable to sit on. As might be expected, this is not the entrance to a normal residential Qatari property, but is one that has been reconstructed or, more accurately, redeveloped using a considerable quantity of naqsh to enhance the prestigious character of the development. The photograph dates from the late nineteen-seventies or early eighties. Compared with the examples below – which are all examples of more important buildings around Qatar, and not residences for ordinary Qataris – this example illustrates a break with those design traditions and reverts to the more historically correct construction vocabulary. Having said that, it is evident that the applied naqsh takes up more of the surface area than would have been the traditional practice, and that its disposition is also atypical in covering the whole of the surface above the door rather than being offered up as panels of naqsh cast on the ground. This would have required the carving do have been executed in situ on the hardened plaster from scaffolding to accommodate the craftsmen. As a further demonstration of wealth and importance, there are two wicket doors set within the main doors, rather than the single khuwkhah that would normally be expected. Contrasting with the above entrance and, for that matter, with those below, is this small but creative design found within an early entrance porch leading into an old residential property in Doha. It appeared to be a complete design, its form suggesting constructions commonly found on the other side of the Gulf, perhaps created in Doha by Iranian craftsmen in the mid twentieth century. Here the construction is unlikely to be structural but is applied plasterwork in a latticed configuration bearing a resemblance to simple pendentive structures. It is possible that there was intended to be further decoration above the lattice work, but this is conjectural; close examination of other photographs of the work suggests that there was no decoration that subsequently disappeared. Note that the entrance contains a pair of dikka flanking the entrance, a feature of many important entrances. Its strength lies in large measure to its simplicity, perhaps a reflection of the wahhabi tradition that influenced much of the early architecture of the peninsula. A dikka was a very common feature outside or just inside the entrances to large residential compounds. It also featured outside the properties of ordinary citizens living in smaller compounds, often as a built-in feature or as a raised timber seat. However, it might be instructive to look at the larger examples as these are what the ordinary citizen would have been aware of and to which he might aspire. The photograph above may be of the same entrance as that shown at the end of the section immediately above, but I have to admit that I’m unsure. Whether or not it is, the two photographs were taken around thirty years apart and, if not the same, there are a large number of similarities between them. This entrance was in a side road off the main Rayyan Road and led into the family side of the residential development. Although difficult to see here, there is a natuwr by the pillar on the right, standing behind his folding steel chair. The reason for breaking out the subject of entrances is that they have developed from the traditional models where they were relatively integrated into the structure of the compound, and have become more decorative elements. Even though they may have a three-dimensional quality to them, they are mainly a two-dimensional feature of the boundary wall. This night shot of the entrance to a compound where the majlis is integrated into the front of the compound illustrates the importance of the entrance in social terms. Men sit on the dikka and camels stand nearby. In design terms there is a series of spaces moving out from the private to the public realm, articulated by the building, entrance, dikka and the areas beyond. By contrast, the entrance structure marks a single movement, from the private to public realm. It may be designed to make the entrance more apparent, but its real purpose is to be seen as a feature. This first example is of the two entrances to a large residential compound. One of the entrances is to the majlis located between the two entrances, one of which is to the family side of the compound. The wall is strongly coloured with a decorative top to it and the two entrance structures sit below the top of the wall, each with a small dikka incorporated into them. The design is played down and can be argued to fall within the precepts of wahhabi asceticism. Compare that with this example whose architectural provenances is not from the region, but has been imported and illustrates a number of influences. The gate is taller than the wall and has most of its structure within the curtilage of the property. In this it follows the traditional plan form of architectural compounds within the peninsula a hundred years ago. Although I don’t recollect seeing the gate open, it is a certainty that there would have been a dikka lining both sides of the structure beyond the gate. In this it is conceptually similar to the entrances to the residential compound of Sheikh Abdullah bin Jassim at feriq al-Salata. The first of these two examples has been added as, technically, it is the entrance to a residence, the building to which it leads being the State’s Guest Palace. Protocol requires that this building is given to a visiting Head of State for his use. In essence it is his home for the duration of his stay. It is a more mature design than most of those which are illustrated here. The structure housing the gate has been designed to have security on both sides, the structure is integrated into the site’s surrounding wall, and it has a degree of dignity for a project dating back fifty years or so, part of the new wave of architectural developments after the Second World War. As with many of these entrance structures, neon lighting tubes are featured, here both spelling out the shahada as well as the national flag. The second photograph has been added by way of contrast, illustrating the State’s approach to a more functional security requirement. Note, again, the addition of the shahada and the use of neon tubing to create the national flag in both of the first two examples, the third photograph being a detail of the neon design taken in August 1972. 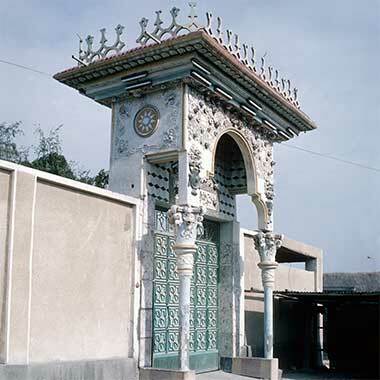 Here are three more examples of entrance gateway decoration, the first being that south-facing entrance gate to the old fort at Wakra, photographed in 1985. Although it is not a residential entrance, it is placed here as an example of a relatively simple gateway decoration. Having said that, the elements of the design are not traditional for the peninsula, though it might be argued that they are developed from traditional architectural details in the region. These next two examples were, however, both photographed in Doha in 1975 and are very different in character. The first is a wonderful piece of architectural design. It appears to have been conceived as a separate structure and bears no relation to the wall in which is sits other than that the steel gates run through more or less in line with the boundary wall with the structure straddling the line of the wall. This is the family entrance to the compound and seems to have suffered in prestige by having an open corrugated iron structure erected immediately adjacent to it under which to shelter cars. In common with many entrances, there is a religious exhortation immediately above the gates, but the over-sailing capping with its piped maraazim and the collection of architectural devices from different cultures appear to contrast with this, particularly with the heavily featured three-dimensional rose element of the façade and capitals. The column bases, extended from the main wall, appear not to have been intended as a dikka and, as this is a family entrance, there is likely only to have been a position for a natuwr inside the gateway. Here a different approach has been taken. Again there is no dikka associated with the entrance, but two chairs indicating that a natuwr would normally be present, which suggests that this, also, is a family entrance to the compound. There is an Art Deco feel to this design, particularly in the patterns used on its attached columns and colouring. There is no religious exhortation though there is some Arabic script in the centre circle of the vertical string of circles on the right column. The design of the gateway appears to have little respect for the wall, and only a small degree of connection to the two projecting rooms which are likely to be for guards or servants. It might be characterised as bland or naïve. Overall, the decorative treatment is naturalistic with a simple geometric device in the centre above the entrance. But the most curious feature to me is the pair of oversized pink and blue scaled fish placed each side of the top, central element of the entrance. 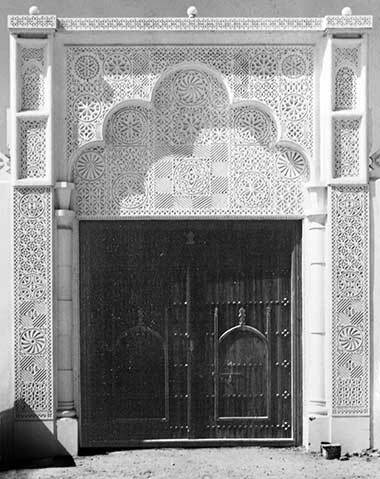 If the above few examples give an indication of how those with wealth created visually stimulating entrances to their compounds in and around Doha, here is an example of an entrance to a new property, the photograph having been taken in March 1975. It shows how one home owner decided to enhance the entrance to his villa. The string course design of the wall has been taken across the pedestrian entrance with its decorated steel doors and projected in a semi-circle to provide a degree of protection as well as emphasis to this important element of the boundary wall. The inside faces of the columns which contain the steel doors have been given a series of recessing planes to emphasise this vertical element of the entrance. This photograph was taken three years previously, in April 1972, and shows an extremely modern design for those days with a number of novel features. The boundary wall has been faced with a strong diagonal pattern, the tiles being relatively rare in those days, most probably imported. On top of the wall is a row of pointed steel rods looking decidedly European. But the entrance gate is extremely unusual, not in the material and patterning of its steel gates, but in the circular reinforced concrete planes creating shelter to those entering and leaving. In the centre there is a feature with a light-bulb shape on which a square sits on its diagonal, in the centre of which there is the single word, Allah giving solemnity to the compound and its entrance. There is more written about traditional entrances and steel gates elsewhere, but it might be useful to add here this photograph which shows how ordinary housing used colour to produce individual entrances to properties, in this case to public housing at Medinat Khalifa. With the State providing the walls and basic steel gates, it was really only the entrances that might provide character and identification to the standard government housing which lay behind them. This pair of gates led to the family side of the compound, the main entrance to the house and its majlis was by a pedestrian gate, usually situated in the centre of the wall. However, not all public houses had their entrances organised using colour. In some buildings owners created a degree of distinction by raising the gate-supporting columns and arranging a feature on top of them. Here, photographed in January 1976, is a gateway canopy under construction at feriq al-Salata al-jadida. A number of similar features were created in public housing areas, giving greater distinction, though with little real protection to those using them, either from the sun or rain. The majlis is the space where the male members of the household entertain their male friends and guests. In fact the majlis is really the space which represents the head of the household. It is his window on the world; it is where he can demonstrate his character and be judged by his peers. As such it is imperative to him that it is organised and decorated in a manner which represents him – without being too ostentatious, and without embarrassing his guests and friends. The first thing to understand is that majaalis differ the higher up the social scale they represent. It may seem obvious, but it doesn’t mean that they are more ostentatious, only that there is an increased formality to them both in their furnishings and in their use and operation. At the highest levels of society the majlis is the space where anybody may go to meet the Ruler, members of the Royal Family, the head of their qabila, an important businessman or other influential member of the society. These more formal majaalis are there for people to have access to those who run the country in their different ways; business is done there in the sense that requests can be made, advice given and, of course, those attending can see each other. The majlis reflects the way society operates and is, in itself, one of its chief mechanisms. The majlis is begun following the five daily prayers. Following prayers at the local mosque the owner of the majlis will go to it and make himself available to those who wish to see him. The pattern is that the same people tend to be there every day – friends and relations – supplemented by those with business of some sort or other and guests who might be passing through the country. The general air is unhurried though the majlis will not last all that long except for the early morning one and, particularly, the evening one which might last all evening as it is, in many ways, the living room of its owner who will sometimes spend more time here than with his family. At the highest levels this is not the case. They might be characterised more as places where formal meetings take place and some business accomplished, perhaps more in the sense of requests being made for assistance at a variety of levels. Following these majaalis the members will move on to another majlis following a virtual social pecking order, and ending the night with their closest friends in the most informal majaalis. When a visitor enters the majlis he will go to the owner and greet him. If he is important to the owner, or is a guest, or has business he will be invited to sit next to him. Arabic qahwa will be served to him followed by shy ahmar, red tea – more of these later. If he is asking for something then that business will be conducted relatively quickly, perhaps even before the coffee and tea, and he will move away to sit somewhere else in the majlis after also greeting other guests in the majlis. If he is an important guest he may remain with the host for the rest of the majlis though at some time in the evening he will greet other important people in the majlis. If the majlis is physically large, there will be some movement not only as people come and go but also as people move to sit next to and talk with others attending it. At the highest levels the majlis is a place to see and be seen so has more of a socio-political relevance to the community, though that might be said of all majaalis. When the majlis is formal as, for example, that of the Head of State, then visitors will go straight to the host, shake his hand – and with older Arabs, perhaps kiss his shoulder or touch noses – then move down the line similarly shaking hands then sitting on one of the available seats where he will wait a short time and then leave, permitting his seat to be taken by others. When the majlis is informal then the visitor will arrive and may find the television on, soft drinks, newspapers and the like around, and a very relaxed air, ghutra s are likely to be taken off and everybody will make themselves at home. I should have mentioned earlier that nearly all formal majaalis are, nowadays, arranged on Western seating – armchairs and sofas – but many people still prefer the older form of dowshek. Where the majlis has Western armchairs and sofas, it is not unusual for guests to sit on the floor, using it as a dowshek and the chair as a misnad. A final note on the operation of the majlis is on the use of a’oud to perfume the room. It is customary, following the serving of qahwa and shy for a midkhan to be brought into the room and taken round all the guests who will waft the smoke towards them, lifting their ghutrah so that the smoke will be trapped and last longer. The smell of a’oud and flavour of qahwa are very much evocative of the majlis and the mark of a good and generous host. I mentioned the smell of a’oud above as this is one of the most distinctive aromas associated with Arabic life, particularly with majaalis. Approaching a majlis this is one of the first clues that the majlis is in operation. Pieces of a’oud are placed on a small amount of charcoal in a midkhan – or incense burner, and allowed to smoke and not catch alight. The a’oud comes in different qualities which guests will be able to appreciate better than a Westerner. The midkhan itself is usually made of tin on the inside and different metals on the outside, commonly decorated with brass studs and mirrorwork. The plasterwork midkhan shown here is more for decorative effect, but I have seen them in use. They are heavier than the metalwork midakhn but of a similar size and shape. Originally they were fabricated by the same craftsmen who were carrying out the first naqsh restoration work on buildings in the country. At all majaalis it is the custom to serve qahwa and shy. The qahwa is served from a della held in the left hand, the right hand holding a set of small finajil into which is poured a small amount of hot Arabic coffee – made from roasted green beans and cardamon – and usually with a flourish. The finjaan is taken with the right hand and sipped while the servant or host will wait. It is customary to accept three cups of qahwa before giving the finjaan back, shaking the hand to indicate you don’t want another. If you don’t shake your hand the cup will be re-filled and returned to you. It is impolite to refuse it. The servant or host will then move on to another guest or, as is more usual, he will serve the number of people for whom he has finajil at the same time, moving backwards and forwards between them. Following the qahwa it is usual to serve shy ahmar. This is usually brought on a tray and is hot tea, served without milk but with quite a bit of sugar. It is usual to take only a single cup of this tea which, again, is served in a small glass cup of tall proportions, often on its own small saucer with spoon and additional sugar lumps in it. In summer, shy na’na is usually served. Essentially it is shy ahmar with the addition of fresh mint leaves and sugar and is very refreshing. In winter, zanjabil is sometimes served. It is a warming drink made with ginger and condensed milk, again with sugar. Soft drinks are now very much a feature of majlis life, particularly in summer. Bottled water is commonly available but glass bottles of soft drinks are often served from a tray and drunk either from the bottle or a glass, depending on the formality of the particular majlis. Before I leave the subject of majaalis, I should mention one other type of majlis, that is the Arabic room or majlis. A number of Qataris have created a room in their house which has, to them, the character of an Arabic majlis. They are curious rooms in that they contain a number of elements that are not typical to the region but perhaps are more derived from northern Arabic countries. Typically they have seating provided by a peripheral dowshek, complete with misaanid. The walls will have mushrabiyah with, perhaps, coloured glass and brass. Unusually there may also be pictures, usually of wooded mountains with flowing streams. The floor will be covered heavily with sijaad and, perhaps, kilim, though these are not thought of so highly. Lighting will be by perforated brass lanterns of a type found from Morocco to Syria. They are rooms for relaxation with close friends and guests. Finally, I should add that although I have talked about majaalis as being discrete, designed rooms, there is a tendency for them to be created in odd areas on both a temporary or permanent basis, particularly by the women of the household. A favourite place is in a suitably sized corridor from which the whole of the operation of the interior of the house can be viewed and governed. Generally this will be a space on the ground floor to which there is reasonable access from an external door. Lighting seems not to be a key issue, but a telephone is as is the ability to see what is happening in the kitchen and with children. Let’s begin with the way in which the household works. The family is the focal point in Islam. At its simplest, women run the household and have to be able to operate within the house in complete privacy, with no possiblity of being seen from outside – or even by visitors to the house and its plot. This principle is of paramount importance, though is often ignored by designers. Most of the time the women of the household will remain within the walls of the house and will have a literally limited perspective. Though women used to visit other members of the family or go to the suq occasionally, customarily this exercise would be carried out by the men of the house, or by a servant. This is now changing, however and, depending on perceived status and education, many more women are moving into public areas. Complicating the way in which the interior of the house is used by the family is the relationship between different elements of the household functions. The following diagram shows the relationships between these different areas characterised by a simplistic degree of requirement. This diagram has been drawn up in order to provide information that I hope might be of use to those designing buildings for Gulf Arabs. It might be usefully viewed with a diagram above. It is important only to the extent to which the different functions on and connected to the site are related to each other. Other factors will also apply. The assessments in making the diagram are my own but are based on considerable experience of the manner in which Gulf Arabs live and, particularly, by my first hand observation of the problems caused by poor design and its impact on those having to live in less than satisfactory arrangements. The sadness is that this is a problem that persists and can be caused by a combination of both a lack of knowledge or an unfamiliarity by the designer and a lack of understanding of the client. The diagram sets out internal and external spaces using a standard Western architectural vocabulary. Care needs to be taken in making the adjustments for designing in the Gulf. In most of my notes on these pages I have, and will, talk about rooms and spaces as having the naming with which we are very familiar. So familiar, in fact, that we tend not to think much about them and their meaning. To some extent this is laziness on my part but it is useful to give these names as shorthand for a general understanding of how rooms and spaces might be dressed and used. Yet not only has there been a significant change in use and, therefore, of naming over the past generation in the West but – as should be borne in the minds of all designers in the Gulf – modern Gulf houses are novel in many of their aspects. In particular, houses are not used in the same manner in which Westerners live in their houses and, of course, there are significant differences in the ways in which Westerners operate in their own houses. The reasons for this are many and, reading through the following notes, I hope a better understanding of this will be gained. There are significant cultural reasons, of course, but two which designers should be aware of are the freedom obtained by the provision of large spaces, and the resulting capability of people to use those spaces in a manner in which the designer may not have originally foreseen. Here, for instance, a young boy enjoys himself playing on a set of swings which might normally be considered as a play frame located outdoors. sand, plaster and carpets on the floor. Much of this is dealt with elsewhere – floors and ceilings and walls – but here there is a brief description of some of the effects achieved with the materials readily to hand. The ceilings of most rooms were constructed with mangrove poles over which reed mats were laid prior to the finishing materials above, there being bamboo or palm spines used to spread the load from the fill above the matting. Usually the arrangement of material above the mangrove poles was simple, but often a degree of care was taken with the canes being laid out in simple patterns to create interest. In these two ceiling arrangements, both photographed in Wakra in 1973, paint has been applied to the mangrove poles as well as to some of the canes above them, further enhancing the ceilings in what were relatively important rooms, perhaps even majaalis, though I can’t recall exactly. The lower example shows a definite attempt to make a pattern of the colours applied to the canes. Where the room was of a high quality, then timber boarding was introduced to finish the ceiling. This was an expensive solution as the wood had to be imported and, as a finished plank, it would have cost the owner considerably more than the standard finish. In this example, again photographed in Wakra in 1972, the ceiling was given a painted finish. There appears to have been a blue background with a yellow chevron pattern at the side and diamond and simple circular patterns running down the centre of the ceiling. The colours appear to have been simple primary paints, again imported. In many of these ceilings, the coving acted as an element of the ceiling design, linking the decoration and material of the walls by its development as a cantilever, reducing the span of the mangrove poles. In the first simple, single storey structures, the walls were generally constructed of mud bricks or massed stone and mortar relieved by niches used for the storage of the relatively few household and personal items of the room user. The first photograph here, of a mud brick room in Umm Salal Muhammad, 1980, illustrates the simplest form of room with two niches incorporated in the structure – the holes being caused by erosion – although nothing remains of any decoration which might have finished the walls. It is probable that it was left unfinished, though a nuwra lime wash may have been used to reflect more light within a room whose only source of light was from the doorway. Decoration of walls appears to have been introduced naturally, with the ruwshaanaat in the walls taking a more decorative character, the naqsh plaster carving being used to frame the niches, or the niches themselves becoming more decoratively shaped as illustrated on this page. The room shown here shows a fairly advanced decorative treatment to a wall in a room in Wakra, photographed in 1972. Although the room is small, the whole of the wall has a monochrome treatment, probably to maximise the amount of light in it as it would have been dark even when lit with a kerosene lamp or, as here, with a single electric bulb. In some rooms colour was added, usually in an ad hoc manner and to suit the taste of the person living there. It is probable that this might only happen where the room was given over to a single individual living in it, rather than in a room which had the traditional communal character both in terms of those using it as well as in its uses. On the left of the photograph can be seen a watad, a turned wooden peg set into the room and on which clothes were hung. This was one area where there always appears to have been decoration as seen in this small collection of awtad seen in the lower photograph. While the above styles of decoration reflected the construction of traditional buildings, increasingly the housing developed in the major conurbations had walls with little or no ruwshaanaat incorporated in them, allowing those living in them to decorate as they wished. Interestingly this rarely appears to have been carried out in walls covered in single colours, but was characterised by decorative features, the first photograph illustrating something of that character of decoration, unfortunately faded by time and exposure. The second photograph is not representative of the decoration of traditional houses decorated by Qataris, but illustrates something of what happens when expatriates take over the old housing. Here, workers from the Indian sub-continent were housed for a time, decorating their rooms with vegetative and religious or national patterns, the latter being the moon and crescent symbols. This form of decoration is also found on external walls as well as doors in the older parts of Doha, some of which are shown above. Traditionally the floors of rooms were simply finished. Sifted and beaten earth would have been the finish in the early rooms, this later being made easier to clean by an admixture of juss to produce a smooth finish capable of being easily swept, though not a particularly hard-wearing surface. Later, with the introduction of cement to the peninsula, this material was used to finish the floor surfaces, producing a hard washable surface. I have also seen a room with shell sand on the floor, but it is not clear how commonplace this was. Reed mats were commonly used on floors to provide a degree of isolation from the floor as well as something of a decorative feature. This was particularly true of the sufra traditionally used to serve food and from which to eat, though would not have been a feature of the floor in a normal room. With more disposable income rugs were brought into the country from the other side of the Gulf, first the kilim and then the tufted carpet. Floors in traditional buildings were originally of hard-packed earth or teen, a material which gave way to forms of cement when they became available. These were not the most comfortable of materials to live with, nor were the floor tiles which next arrived with the development of concrete and cement constructions. Usually these were of terrazzo, while in the more expensive buildings marble might be used. But these two materials were useful in that it was easy to wash and clean down the floors even if they might be uncomfortable under certain conditions. It has to be borne in mind that, traditionally, people customarily sat on the floor. In the majlis this would be on dowaashek arranged around the periphery of the room, and these would also be used to allow people to sleep with a degree of comfort. In the majlis or ghurfat al-sufra, food was placed on a sufra, sometimes with an oilcloth or similar underneath it, a practice which continues today, particularly with carpets. Having a washable floor in these circumstances was useful. In both badawi tents as well as traditional rooms, rugs were introduced to bring a little comfort to those using them. Something of their character can be seen in this photograph of a tent being used. The character of these rugs depended to a large extent upon the wealth of the owners as they were one of the elements which might demonstrate hospitality to guests. A detail of a badu runner is shown here. These runners were a common feature of tents, being used both as inner walls as well as floor coverings. These runners were flat woven on small looms creating pieces of material around 60 cms wide which could be sewn together in order to create wider runners. While the second photograph shows a more decorative and sophisticated design than the simple runner above it, for obvious reasons the patterns of these traditional runners are predominately linear in design. Where funds were available, it was common to use a flat woven kilim. This was one of the common items of trade brought over from Persia on the other side of the Gulf, or down from Iraq. Compared with the runner, the kilim had a different proportion and, generally, was able to cover a larger area of floor. The benefit of both runner and kilim is that they were very flexible in use, capable of being moved around a house from room to room or veranda, and of being carried when on the move. This photograph illustrates a typical detail of part of a kilim woven by the Qashqai in Iran. Both the runner and kilim are flat woven and, therefore, capable of displaying only a limited range of patterns. Knotted carpets, on the other hand, are able to show a fine degree of detail, this being governed by the density of knots in their construction. Generally, Persian carpets were a luxury and, although less expensive knotted carpets were available from the Indian sub-continent, it was the Persian variety which were preferred. The first photograph here shows the central figure from a good quality Persian carpet. It is geometrically accurate, will be relatively expensive and is the type of carpet which those with sufficient funds will prefer to use in their majaalis or offices in order to indicate their taste and status. The second photograph – also illustrating the degree of detail possible, but a rug with far less knots per inch – is one which the merchant claimed to be based on the Rubáiyát of Omar Khayyám, coincidentally showing that rugs of this character are still being manufactured despite the proscription on figurative work. The reason it is shown here is to give an indication of the type of carpet that might be used in the privacy of the family side of the household, or in the less formal majaalis in which some, particularly the young, entertain friends. A solid floor, finished with terrazzo or marble tiles, works well in its suitability in summer where it operates as a cooling mechanism, as well as being easily cleaned. However, in winter it feels decidedly cold. The solution to this has been to use rugs on the floor, the thicker the better, suggesting that knotted rugs are better than the thinner kilim. But increasing disposable income has introduced the affordability of fitted carpets to both residential and other types of building and the local merchants have pressed their incorporation in new buildings as there is no longer the same need to wash floors when buildings are air-conditioned, summer and winter. While fitted carpets have many benefits in terms of comfort, they also suffer from spilled drinks and the like, even though there is a considerable workforce available to keep houses and other buildings clean. In ordinary houses, whether there are fitted carpets or not, knotted carpets are not uncommon, often from other regions than Iran, such as Turkmen carpets – sometimes known as Bukhara carpets – and carpets which may even be machine made rather than hand-knotted, and fabricated in countries such as Pakistan or in the Far East. Commonly these carpets are a dark red and suited to masking food and drink dropped on them. Generally, carpets which are fitted in houses are plain and pale in colour and are used as a background to display Persian rugs and the like. In the more prestigious houses and in important commercial properties, the carpets which are fitted are often custom designed with peripheral or central designs incorporated in their manufacture either through colour or texture or relief, the latter sculpting being demonstrated as the two examples shown in the sample carpet of this first photograph. A variation of this is to have a running edge design, usually decorative or of contrasting colour, sewn onto the central carpet. But more usually, fitted carpets are not designed on a room by room basis but have plain or small scale patterns suited to accommodate any shape of room. Where Persian or other carpets are placed on top of them, they fit as best they may, and might not always be able to sit with an equal border of fitted carpet around them, as is shown here in this second photograph. For those who like to use Persian carpets, a pale, neutral fitted carpet is often chosen – such as beige – against which carpets such as Na’ins, which have a high number of knots per square inch and can be predominately beige and blue, may be displayed to good effect, as shown in this photograph. If possible, and in large rooms, a pair of Persian carpets might be selected, good carpets often being woven as a pair over a central wooden frame. The proportions and sizes of such carpets can be a problem when attempting to fit them in existing rooms. It is not uncommon for the need to put three carpets in very large rooms such as State majaalis, the third being located centrally; but finding a suitably sized and coloured rug can be extremely difficult. In Britain, for example, there has been a significant change in the manner in which houses have been used over the last two generations. This has been noted and remarked on by a number of authorities who have described the effects of kinship and its relationship with proximity, disposable income and other issues. At its simplest there has been a change in layout in the West where a parlour was set aside at the front of the house in which guests would be entertained in a setting where the family mementoes and best furniture would be arranged, but which the family would not normally occupy, thus reducing the amount of usable space available to them at the expense of having a room where they could display themselves to the outside world. Day to day living would be in a room at the back of the house, relating both to the kitchen and the outside lavatory facilities. Again, in the West the rooms of the house were named in accordance with their main functions and were mainly compartmented due to the need for a degree of privacy, but also in order to be able to keep rooms relatively warm. Access to rooms was from a corridor, and corridors were linked by stairs when the density at which housing was constructed dictated more than a single storey. A notable feature of such housing was the kitchen in which many of the functions of the house were focussed due to its relative warmth. In houses large and small there would be a significant temperature difference between usable rooms and circulation spaces, particularly in winter when heating was by wood or coal fires located individually in the main rooms of the house. Later this was alleviated to some extent by the development of heating systems warming spaces with the circulation of hot water filled radiators. Even later, space heating systems, such as underfloor heating, enabled a more flexible use of spaces and encouraged larger, multi-functional spaces to reflect more modern life styles. Toilet facilities were provided outside the main structure of the house with waste being led in the first instance to septic tanks and, later, through public sewerage systems. In the Gulf, as I have written about elsewhere, houses consisted of a series of rooms which were multi-functional and generally having their access gained from a veranda open on one side. When Qatar’s Ministry of Public Works began its programme of housing development it was noticeable that the rooms of the new houses were at first labelled in Arabic: ‘majlis’, ‘kitchen’, ‘bathroom’ and ‘room’ though this was later amended to ‘majlis’, ‘dining’, ‘kitchen’, ‘bathroom’ and ‘bedroom’. This was significant for two reasons. Firstly, the concept of having rooms set aside for a specific purpose was novel and followed Western practice and, secondly, the naming of the rooms followed similarly with the obvious exception of the majlis which might be considered to be similar to the Western ‘drawing’ or ‘living’ room. Significantly, the designers of those first houses were northern Arabs who brought to their work the understanding of the housing they had first experienced a generation or two earlier. This seems to have been very similar to what might have been laid out by a Western designer, having similar spatial relationships in terms of the disposition of uses, corridors for access and isolation, but a poor internal layout of bathrooms and kitchens together with difficult relationships with external spaces. These first houses were aspirational in the sense that they were organised to receive the furnishings, furniture and white goods now being imported to the peninsula, reflecting the increase in disposable income from the dispersed wealth of the State. 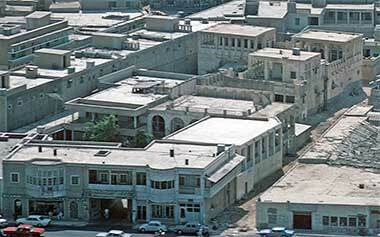 Qatari housing of the seventies and eighties reflected the spatial distribution of Western housing. Generally, the need to reflect socio-cultural practices in the relationships between rooms was ignored by designers and their clients. To some extent this was due to the amount of expatriate housing that was being developed, but was also true for Qatari houses, creating difficulties in their living patterns. Increasing affluence, together with a greater expatriate influence particularly from the United States, is having an effect on the organisation and distribution of spaces within Qatari houses. The concepts of the ‘den’, ‘office’, ‘laundry’, ‘games room’, ‘cinema’, ‘gym’,and the like are being introduced in larger houses, in some cases these spaces being incorporated into majaalis developments. These first two paragraphs have been left in place here. The rest of the notes on bathrooms have been moved and can now be found on the addendum page dealing with elements of buildings. Bathrooms were bought in as suites from the large number of agents who sprang up to supply the nascent housing industry. Bath, wash hand basin and toilet bowl were the standard items, all located in the bathrooms though some of the earlier housing had Asian toilets supplied. Where the house plans had a separate lavatory, that was usually Asian. However, there was no consideration given to the orientation of the toilet or lavatory, this reflecting the direction in which the housing layout dictated the house to be placed. Each bathroom was laid out in the same way with the bath along one wall with a filling piece at the end to make up the difference – usually up to about 750mm – between the length of the bath and the width of the room. A pedestal wash hand basin and toilet completed the set with an uncovered hot water heater situated above the bath. Again, the first three paragraphs on kitchens have been left here for reference, but the notes have been moved to the addendum page dealing with elements of buildings. As with bathrooms, kitchens in the first Qatari houses were laid out little differently from Western kitchens. The units were arranged peripherally with a standard single sink basin and draining board arrangement, the hot water cylinder supplying it being located in the nearest corner of the room, and a space being left for the gas cylinder operated cooker and electric feed for a free-standing refrigerator. A small number of socket outlets were supplied for electrical equipment, often a solitary double outlet supplied this need and the refrigerator. There was no consideration for the principle of work flow and often electric outlets, sink and cooker were dangerously close to each other. A single light was provided in the centre of the room, patently insufficient to give good lighting to the tasks carried out in the kitchen and, of course, located in the worst position for carrying out tasks on the peripheral work surfaces. The kitchen was large enough to accommodate a small table and four chairs and, usually, there was a single window and a standard door giving access to the outside. As the house was always raised above the ground in order to give some protection against flooding as well as taking consideration for the importing of sweet soil to form a garden, the area immediately outside the kitchen door was usually a small quarter landing with a number of steps leading down to the garden level. The notes on laundry have been moved to the addendum page dealing with elements of buildings.